In loving memory of Makani, our cover dog, and pictured to the left. His name means wind and he passed away November 24, 2008. 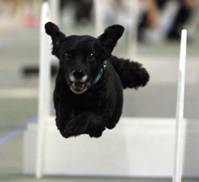 Makani was Bonnie's first flyball dog.